In Heraldric terms BLUE stands for Truth and Loyalty. The Black represents society. The top half represents good and the bottom evil or chaos. The Blue line seperating the top and bottom is the line of men and woman who stand between good and evil. The people who go to work everyday to make sure your world is a safer place. This ring represents the blue line those with the courage to face danger and evil on a daily basis form to create safety. Its made from Zirconia ceramic. Zirconia ceramic is rated extremely hard, durable. measuring 8.7 on the Moh’s scale of hardness it&#39s as hard as sapphire and second in hardness only to diamonds. 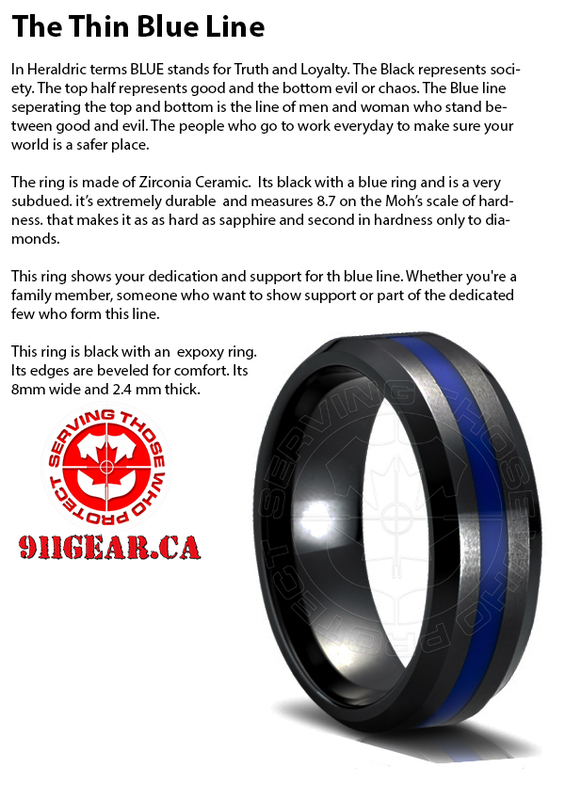 this ring shows your dedication and support the blue line. Whether you&#39re a family member, someone who shows support or part of the dedicated few who form this line.